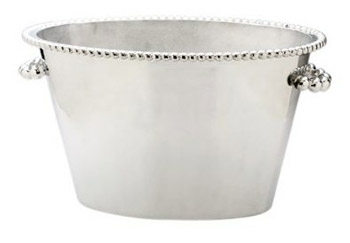 Don't let the elegance of design fool you - this ice bucket is very durable and essential to the collection of any party giver. Part of Mariposa's String of Pearls collection. Designed by Michael Updike. Handmade in Mexico of recycled sandcast aluminum. Dimensions: 17.5" L x 12.5" W x 10.5" H.